Seasonal tale from beyond the shadows.. The burning sensation in his lungs told him he could not hold his breath for much longer, somewhere in the darkness beyond he could hear them still searching for him. The stench of urine and decaying refuse was overpowering, and the cold steel of the dumpster he hid behind, was seeping through his body. Finally they seemed to have given up and moved on, he let out the pent up breath in a long sigh. Before he had even stood upright they were on him, the gruesome rubbery features of their costumes looked terrifyingly real in the dimness of the alleyway. A bony fist collided with the side of his head and a purple flash of light went off somewhere behind his eyes. “Trick or treat, trick or treat” They chanted with each jarring kick to his ribs, eventually even the dim light in the alleyway faded to darkness. A moaning sound awoken him from a bad dream, it took Joe Cummins a few moments to realize that the moaning sound was coming from him. At some stage while he was out it had started to rain, the white skeleton he had drawn on the black bin liner he wore as a costume, had run into his jeans. One side of his head throbbed with pain and when he moved it felt like someone had left a knife in his ribs. Painfully he got slowly to his feet, his first thought was for the small bag of treats he had manged to collect. But the neighborhood kids, who had chased him down this alleyway, were long gone with his treats. Dejectedly he began to make his way home; it wasn’t easy being different in this neighborhood. If you didn’t fit in, then you were a target and being poor meant Joe did not fit in. The rest of the kids went trick or treating in groups, every one of them adorned in expensive shop bought costumes. Joe should have known he would stand out like a sore thumb, with his homemade bin liner costume and his face done up with his mum's old makeup. A flash of bitterness erupted in his mind when he thought of her, if she had not gone and got sick things might be different. Everything had gone to hell in a hang basket since she died, that was when dad started drinking and lost his job. Sometimes he wondered which of them he hated most, his mother for dying or his father for letting everything go to hell. Groups of children passed him as he made his way home; some of the younger ones were accompanied by a parent. All these kids had one thing in common, they had shop bought costumes and they looked happy. Joe let himself in quietly and stood in the dark hallway, the house was freezing and silent, save for the low sound of someone snoring. The smell of cheap booze hit him before he got to the living room door; the old man was in a stupor in the armchair, the empty cheap whiskey bottle on the floor beside him. Joe did not even bother to check if there was any food in the kitchen, opting to go upstairs to bathroom and clean up instead. The fake blood he had drawn on his face with an old lipstick had been washed off by the rain, in its place a patch of dried blood stretched from a cut on his temple to the corner of his mouth. When he had cleaned himself up, he went to his room and stripped before climbing into bed. Lying in the darkness he fought to hold back the tears, closing his eyes tightly he tried to remember his mother’s face. But try as he would he could not summon her image to his mind, instead the horrifying rubber masks of his attackers played a loop in his head. He could almost feel each kick again and the chant of trick or treat rang out in his mind. Somehow the tears he had been holding back bubbled to the surface; they squeezed under his tightly closed eyelids and soaked in to his pillow. Laying there he allowed the tears of pain and anger to flow freely now, Joe cried until he was exhausted. The pain of the last few years washed over him in waves; now that the dam had burst he could not hold it back. In the end he felt empty but the images of his attackers had faded, he eventually drifted off to sleep with a determined thought. Next year would be different, he would have the best costume ever and he would no longer be a victim. Joe looked around the yard in satisfaction, not a single stray leaf could be seen anywhere. They were all neatly raked in to a big pile at the bottom of the garden, a feeling of euphoria bubbled up inside him. Once the house owner paid him he would have enough for the costume he had picked out, it was the most realistic ghoul costume he had ever seen. There would be no homemade bin liner costume for him this year; he would be just like all the other kids in the neighborhood with a real shop bought costume. A costume that would completely disguise his real appearance, the rest of the kids would never know that the person behind the costume was the neighborhood drunk’s son. For the first time in quite a while, Joe felt he could fit right in. Grasping the coins tightly in his hand he ran home, he just needed to get the rest of his savings and run to the costume shop. Staring into the empty cigar box he blinked his eyes rapidly to clear the tears, this could not be right. Just this morning before he left the house, he had counted the money again. There had been almost nine dollars in loose change in this very box, weeks of cleaning yards and running errands had helped him to accumulate that money. With the payment he had just received, Joe would have had enough for that costume and money left over for a candy bar. It was all too much for him now and Joe’s mind seemed to shut down, when his mind began to work again he found himself standing on the sidewalk outside the costume shop. It was dark now and the shop was closed, the place in the window where his costume had hung was empty now and the tears began to flow again. Joe was unaware of the tall stranger standing beside him until he felt the hand gently squeeze his shoulder, he looked up into the stranger’s dark eyes and suddenly he felt that everything was going to be alright. The tall man led him to the back of the dusty old shop; everything on display was as old as god and covered in a heavy lair of dust. Pulling back a heavy red velvet curtain the man beckoned Joe forward, behind the curtain was an alcove where hung the most unbelievable Halloween costumes Joe had ever seen. Ghouls, witches, Zombies and others too horrible to even describe, these were far superior to anything the costume shop had on offer. Joe was drawn to a ghoul costume complete with rubber hands sporting razor like nails, stepping forward he put his hand on it. The material felt more like real skin than rubber, behind him he heard the tall man chuckle to himself. “An excellent choice! Joseph”. The man whispered. “Now try it on”. The moment Joe put the costume on he knew it was the best costume ever, it was as if he was transformed by it. The small figure in the homemade mummy costume ran as fast as he could, the bandages his mother had spent so much time wrapping around him, had come loose and threatened to trip him up. 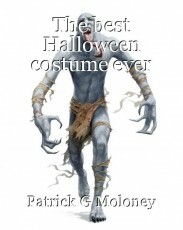 But he had no time to stop and fix them; the group of older kids in the shop bought costumes were gaining fast on him. Darting down the alleyway he hid in the shadows among the filth, the pursuing group stopped and moved quietly after him. The frightened boy cowered against the wall as they surrounded him, the small bag of treats he had collected grasped tightly in his fist. Raising his foot the ring leader began to chant. “Trick” Joe stepped from the shadows and finished his sentence for him. “Or treat” The razor like nails on his costume moved like a blur, one solitary scream escaped from the group before he cut them to ribbons. By the time he was finished the young boy had run from the scene, leaving behind him the solitary figure of Joe standing among the carnage. Joe turned and headed home to show his knew costume to dad, he had a treat for that drunkard too. © Copyright 2019 Patrick G Moloney. All rights reserved. This page was created in 0.3910 seconds.